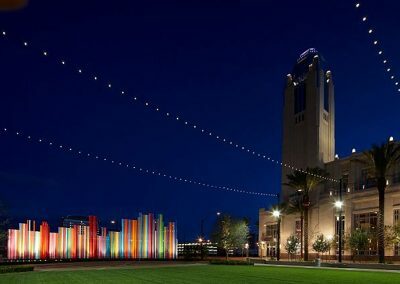 Las Vegas’ first true performing arts complex features a state-of-the-art, 2,050 seat concert hall for symphonies, Broadway style productions, and major concerts; a 258-seat cabaret theater; a 200-seat studio theater; and the Discovery Children’s Museum. Just west of Downtown Las Vegas, near the Las Vegas Design Center and the Las Vegas Premium Outlets North. It’ll depend on what show you are seeing, but most of it will be high-quality stuff. The main concert hall has a Broadway series featuring some of the hottest touring shows. Something Las Vegas can be proud of. Las Vegas has never been a stranger to entertainment. From the gaudy showgirl spectacles of the past to the Cirque du Soleil productions of the present (with stops at big name headliners, magic shows, impersonator acts, transplanted Broadway productions, and more in between), Vegas has always had an almost endless supply of what could be loosely categorized as the performing arts. But the one thing it has never had is a true performing arts center; a place dedicated to theater that doesn’t have a bunch of slot machines and all-you-can-eat buffets lurking right outside its doors. 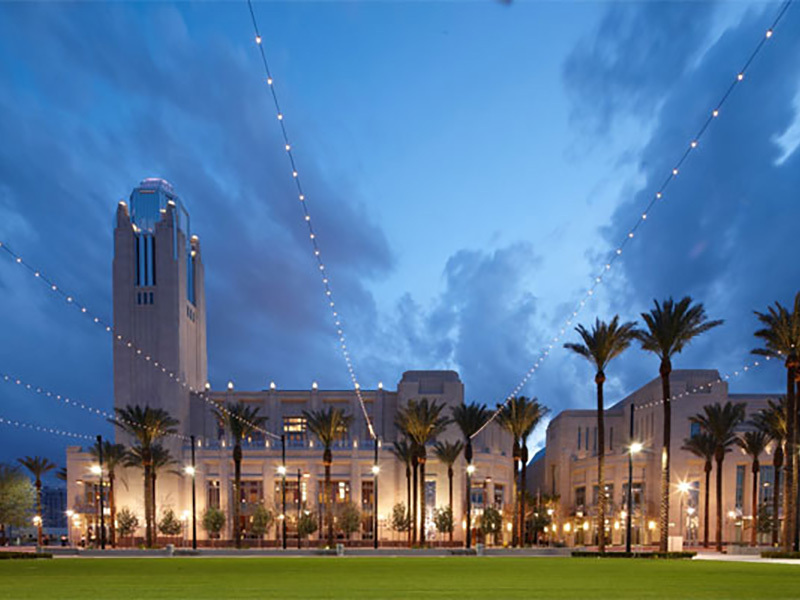 That has all changed because of The Smith Center for the Performing Arts, a world-class facility that puts Las Vegas on the map as a cultural destination for something other than those French acrobats. 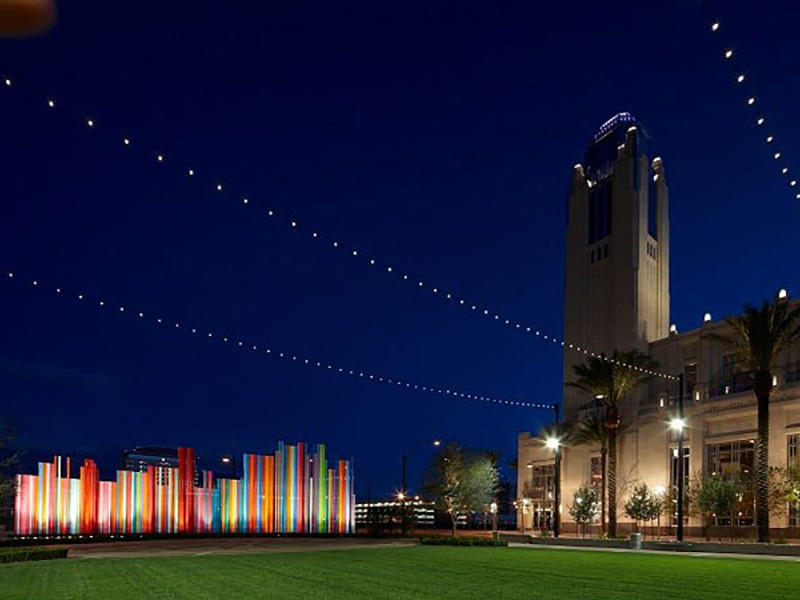 Located just west of Downtown Las Vegas in the Union Park area, The Smith Center is right across the street from the World Market Center and Las Vegas Design Center and just a few steps away from the Las Vegas Premium Outlets North. That makes it a five minute cab ride from the Fremont Street Experience and maybe 15 minutes from The Strip. 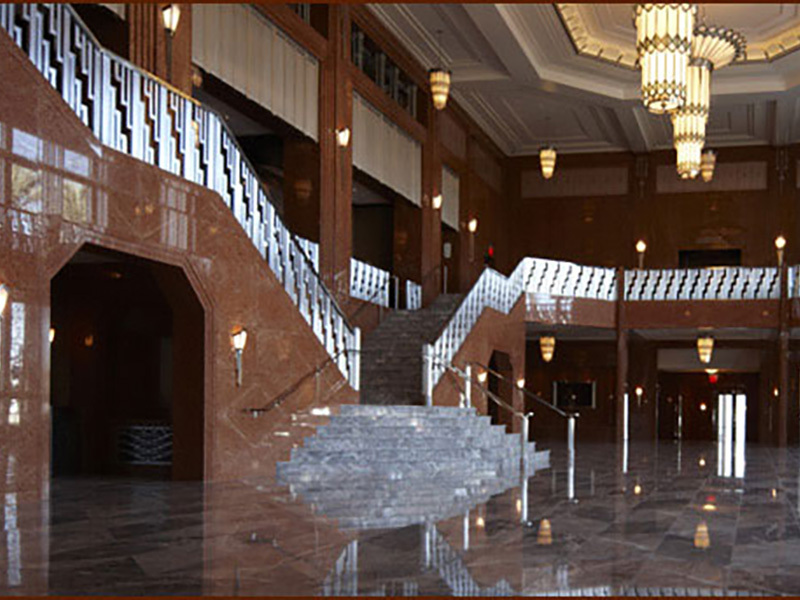 The complex features a timeless, art deco design inspired by the graceful lines and architecture cues of Hoover Dam. The exterior is clad in Indiana limestone, giving it a sense of solidity and permanence that many Vegas buildings seem to lack. The focal point is a 16 story bell tower that features a four-octave Carillon comprised of 47 handcrafted bronze bells. All of this can be viewed from a small park on the north side of the complex that will host outdoor events. Inside the art deco theme continues with a stunning series of public spaces. The lobby of the main theater, Reynolds Hall, is done in intricately cut and patterned, earth-toned Italian marble and accented by custom designed lighting fixtures that evoke the water intake towers at Hoover Dam. A second floor overlooking the lobby features comfortable seating areas and two lounges. Throughout are eye-catching design elements like chrome trimmed railings on staircases and natural light popping in through skylights in unexpected places. It’s elegant yet completely comfortable. To say the space is dramatic is an understatement. Many buildings in Las Vegas have tried to create luxurious surroundings but no matter how good they are, something always feels a bit fake, even when they aren’t trying to recreate Rome or Venice or Egypt. 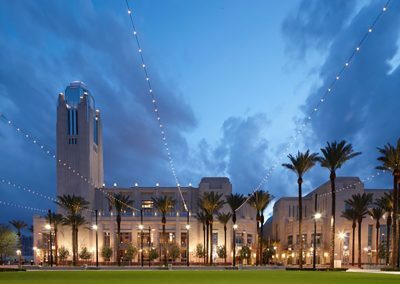 There is no better way to describe it than to say that The Smith Center feels “real;” it’s the kind of building that you could envision being here 100 years from now, long after most of the casinos on The Strip have been imploded and replaced with something else. 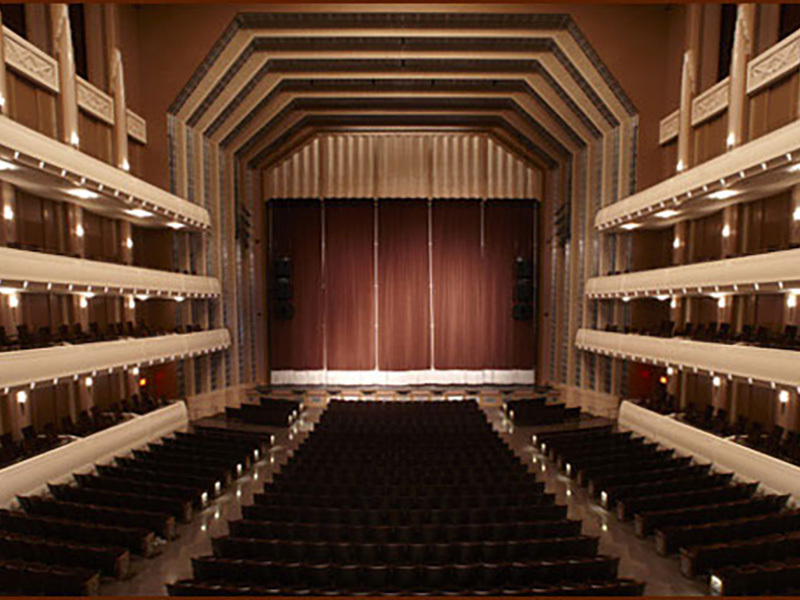 Reynolds Hall is the main performing arts venue, a 2,050 seat concert hall that hosts symphonies, the ballet, touring Broadway shows, and big headliner concerts. 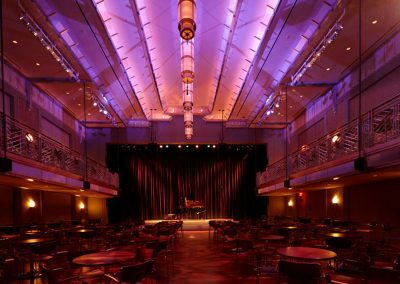 The room features a massive, traditional proscenium stage facing a subtly raked main floor seating section and four tiers of balcony seating under a breathtaking faux-skylight high above. The seats on the main floor are all wider and more plush than your typical Vegas theater with great spacing for long legged folks like myself. The luxury boxes on the second and third levels have flexible seating arrangements and private anterooms where guests can retreat for conversation, drinks, or eats during the shows. The fourth level is steeply raked theater seating and as long as you are not afraid of heights, the views from even the back row are phenomenal. If you are afraid of heights, avoid this section completely. Trust me. The acoustics in the hall are stunning. As I stood on the stage during a tour I could hear every word of a normal-voiced conversation between several employees who were standing on the third balcony at the very back of the hall. An acoustician aimed for Carnegie Hall when developing the sound in the room and although I have never stood on the stage at Carnegie Hall (someday!) I have a hard time believing it could be much better than this. The designers also spent a lot of time and effort on making sure the building was comfortable, accessible, and earth friendly. Guests with mobility issues will have multiple options for getting in, getting around, and seating and everyone will appreciate that a higher than normal number of bathrooms were included in the plan. The entire facility is Silver LEED certified. 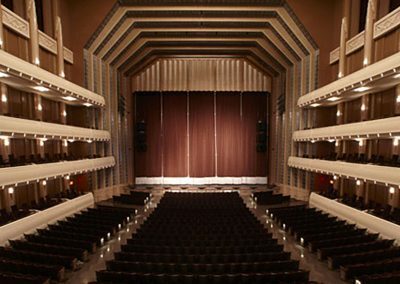 Reynolds Hall is the permanent home to the Nevada Ballet Theater and the Las Vegas Philharmonic and hosts a Broadway Series of touring companies that includes the latest touring shows. Various headliners and theater companies also take the stage here; expect to see performances from the likes of singer Michael Feinstein, the Alvin Ailey American Dance Theater, dancer Savion Glover, and the Pink Floyd Experience. A neighboring building houses the other two performing arts spaces: the 258-seat Cabaret Jazz theater and the 250-seat Troesh Studio Theater. Where the main building has an expansive atmosphere, this building has a much more intimate vibe, with a classic art deco design of green with silver accents and lots of cozy spaces for casual conversation and pre-show cocktails. 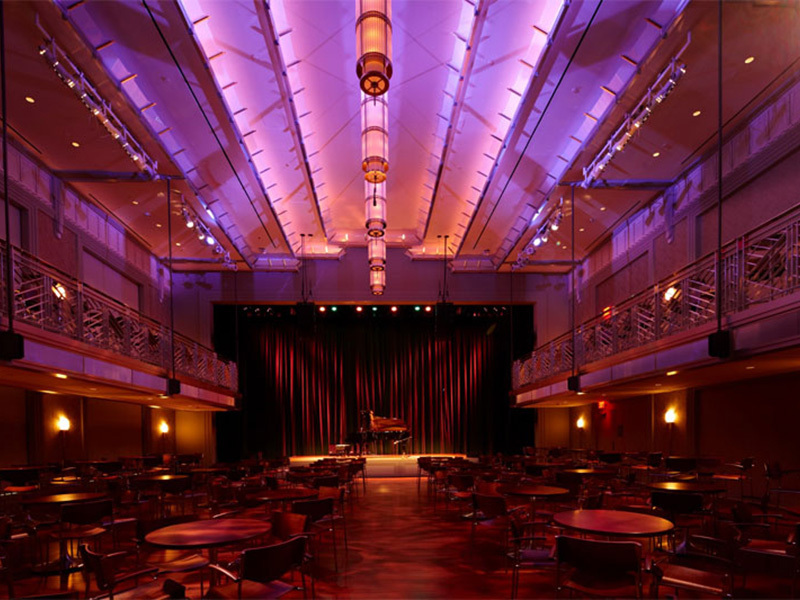 The Cabaret Jazz theater is a two-level space with tables and chairs facing a flexible stage arrangement. Huge windows overlook Downtown Las Vegas giving the room an open and airy feeling missing in most performance spaces. The Troesh Theater is a “black box” of a room, which means that it is basically a big open space that can be configured in a variety of ways. It is primarily be used for smaller productions, concerts, workshops, and rehearsals. Another building is home to the Discovery Children’s Museum, which moved from its Downtown location. I highly recommend that you go to the Smith Center website and sign up for their newsletter, which will keep you apprised of all the events and happenings. This fantastic and impressive facility should be on every Las Vegas visitors’ itinerary.